She who was teasing me with these seductive words temporarily disappeared before my eyes. There could not be a bunny girl inhabiting a library. Azusagawa Sakuta faced a scene that toppled common sense—he encountered a bunny girl, and she is nowhere a normal bunny girl. 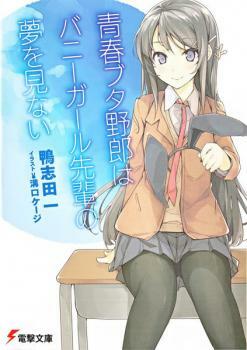 She is Sakurajima Mai senpai, a student studying at the same school as Sakuta and a retired yet renowned actress. It was said that starting from a few days ago, those around her could no longer see her anymore, and she came to the library just to confirm this. Is this related to the hit topic on the internet, the unimaginable phenomenon known as “the puberty syndrome”? Sakuta, wanting to know the reasons behind and get closer to Mai, decided to solve the puzzle. However, the situation then developed in an unexpected way—? In the city surrounded by the skies and the seas, the romance story of she and I began. The brand new romantic comedy presented by the Sakurasou combo. Finished reading all 9 volumes. On one hand, we have quite interesting protagonist, almost non-harem developments, colorful and fun dialogues. On the other hand, a lot of standard patterns/cliches still present.